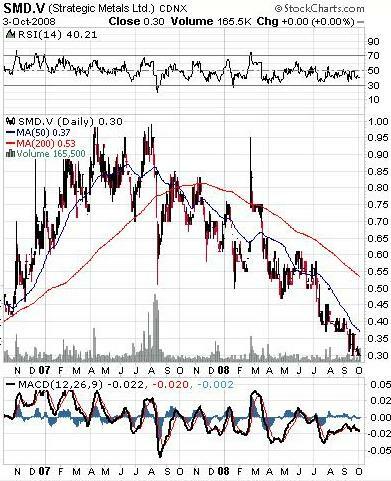 I have been searching for some good buys in this horrible market, and I believe I have found one: SMD.V – Strategic Metals Ltd. However, I believe there are a number of reasons why Strategic Metals is a great buy. First, according to their June 30, 2008 balance sheet, they have over $21.5 million in cash, GICs and marketable securities. They only have $1.3 million in liabilities, so their net liquid cash position is over $20 million. As of August 22, 2008 they had 57,195,725 shares outstanding, so each share is backed by approximately 35 cents in cash. Yes, I realize that their cash position may have eroded somewhat in the last few months, but even so, that’s a lot of cash. 35 cents per share is a lot of cash, because on Friday Strategic Metals Ltd. closed at 30.5 cents. This means that if on Monday you bought SMD for 32 cents, and on Wednesday they liquidated everything and paid you their cash, you would end up with a 3 cent profit, or a ten percent premium over what you paid. Of course they aren’t going to shut down next week, and you aren’t buying the stock for their cash. You are buying the stock for all of their great properties, which you are getting for free. They have precious metals, base metals, and strategic metals, all of which are now free. I like free, so I’m buying. I won’t be chasing the stock, and it appears there is a solid floor at 30 cents, but I assume any purchases in the 30 to 35 cent range will pay off handsomely in the future. (This stock was $1 a year and a half ago). In short, I see no down side risk (it can’t go much below cash value), and lots of upside (since a major producer could buy the entire company for it’s market cap of $17.5 million, and use the company’s cash to pay for it). I don’t know of any newsletter or investment advisor that is recommending this stock, so if it doesn’t work out, you can blame me. I have no affiliation with the company, and I’m not getting any kick back for recommending it. Finally, I’m treating this as a speculative buy, so I’m not putting a substantial amount of my portfolio into it. I recommend that you do your own due diligence, starting on the Strategic Metals web site.